Bu çalışmanın amacı zihinsel, görsel ve işitsel herhangi bir sorunu olmamasına rağmen okuma güçlüğü çeken Ali isimli dördüncü sınıf öğrencisinin okuma akıcılığını geliştirmektir. Doğru okuma, okuma hızı ve okuma prozodisinin ayrı ayrı değerlendirildiği bu çalışmada bu ögelerin gelişim süreci yapılan ölçümlerle betimlenmiştir. Tek denekli araştırma deseni kullanılan bu çalışmada okuma akıcılığını geliştirmek amacıyla tekrarlı okuma, eşli okuma ve kelime inşası tekniği bir arada kullanılmıştır. Çalışma, 2012-2013 eğitim-öğretim yılında Afyonkarahisar ili Gazlıgöl İlkokulu’nda gerçekleştirilmiş ve toplam 30 saat sürmüştür. Elde edilen bulgulara göre kelime tanıma becerisi endişe düzeyinden serbest düzeye, okuma hızı dakikada 20.8’den 34.2’ye ve prozodi puanı %15’den %66’ya yükselmiştir. Bu sonuçlar tekrarlı okuma, eşli okuma ve kelime inşası tekniğinin okuma akıcılığının geliştirilmesinde etkili olduğunu göstermektedir. The aim of the present study was to improve Ali’s reading fluency. In this study, reading fluency was explored in terms of word recognition, reading rate, and reading prosody. Development process of these elements was reported using repeated measures. This study employed single-subject research design. In order to improve reading fluency, a combination of repeated reading, paired reading and word architecture were used. Intervention was implemented at Gazligol Primary School in Afyonkarahisar in 2012-2013 school year and continued for 30 hours. Ali’s level of word recognition was at a frustration level. CWPM was 20.1. Ali’s score of prosody was 15%. After 30 hours of intervention, Ali’s CWPM increased from 20 to 34.2. Ali’s level of word recognition increased to the independent reading level with 99%. For reading prosody, it increased from 15% to 66%. Repeated reading, paired reading and word architecture were found to be efficient on the development of reading fluency. Akyol, H. (2006). Türkçe ilkokuma yazma öğretimi. Ankara: Pegem A Yayıncılık. Akyol, H.(2011). Yeni programa uygun Türkçe öğretim yöntemleri. Ankara: Pegem A Yayıncılık. Akyol, H. & Çetinkaya, Ç. (2009). Diagnosis and elimination of reading difficulty case study. Tür- kiye Sosyal Araştırmalar Dergisi, 3, 9-30. Ates, S. (2013). The effect of repeated reading exercises with performance-based feedback on fluent reading skills. Reading Improvement, 50(4), 158-165. Baştuğ, M. & Keskin, H.K. (2012). Akıcı okuma becerileri ile anlama düzeyleri (Basit ve Çıkarımsal) arasındaki ilişki. 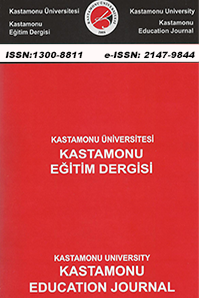 Ahi Evran Üniversitesi Kırşehir Eğitim Fakültesi Dergisi (KEFAD), 13(3), 227-244. Begeny, J. C. (2011). Effects of the helping early literacy with practice strategies (helps) reading fluency program when implemented at different frequencies. School Psychology Review, 40(1), 149-157. Block, C.C.(2003). Literacy difficulties: Diagnosis and instruction for reading specialists and class- room teachers (2nd ed.). Boston: Allyn & Bacon. Caldwell, J.S. (2008). Reading assessment: A primer for teachers and coaches.New York: Guilford Press. Carnine, D. W., Silbert, J., Kame’enui, E. J., & Tarver, S. G. (2004). Direct instruction reading (4th ed.). Upper Saddle River, NJ: Pearson Education. Chard, D. J., Vaughn, S., & Tyler, B. (2002). A synthesis of research on effective interventions for building reading fluency with elementary students with leaming disabilities. Journal of Leam- ing Disabilities, 35, 386- 406. Daane, M., Campbell, J., Grigg, W., Goodman, M., & Oranje, A. (2005). Fourth-grade students reading aloud: NAEP 2002 special study of oral reading (NCES 2006-469). National Center for Education Statistics. Washington, DC: Government Printing Office. Dowhower, S. L. (1987). Effects of repeated reading on second-grade transitional readers’ fluency and comprehension. Reading Research Quarterly, 22, 389-406. Dowhower, S. L. (1991). Speaking of prosody: Fluency’s unattended bed fellow. Theory in Practice, 30, 158-164. Dowhower, S.L. (1994). Repeated reading revisited: Research into practice. Reading & Writing Quarterly, 10(4), 343–358. Duran, E. (2013). Case study on the effect of word repetition method supported by neuro- logical affecting model on fluent reading. Reading Improvement, 50, 34-41. Fiala, C. L., & Sheridan, S. M. (2003). Parent involvement and reading: Using curricu- lum‐based measurement to assess the effects of paired reading. Psychology in the Schools, 40(6), 613-626. Fraenkel, J.R., & Wallen, N.E. (2006). How to design and evaluate research in education. New York: McGraw-Hill. Hollingsworth, P. M. (1970). An experiment with the impress method of teaching reading. The Reading Teacher, 24, 112-114,187. Kame’enui, E. J., & Simmons, D. C. (2001). Introduction to this special issue: The DNA of reading fluency. Scientific Studies of Reading, 5, 203-210. Keskin, H.K. & Baştuğ, M.(2013). Geçmişten günümüze akıcı okuma, Türkiye Sosyal Araştırmalar Dergisi, 17(1), 189-208. Keskin, H., & Baştuğ, M. (2011, Mayıs). İlköğretim dördüncü sınıf öğrencilerinin sesli okuma ve konuşma prozodileri arasındaki ilişkinin incelenmesi. 10. Ulusal Sınıf Öğret- menliği Sempozyumunda sunulmuş bildiri, Cumhuriyet Üniversitesi, Sivas, Türkiye. Kuhn, M. R., & Stahl, S. (2003). Fluency: A review of developmental and remedial strat- egies. The Journal of Educational Psychology, 95, 1–19. Kuhn, M. R., Schwanenflugel, P. J., Morris, R. D., Morrow, L. M., Woo, D. G., Meisin- ger, E. B., ... & Stahl, S. A. (2006). Teaching children to become fluent and automatic readers. Journal of Literacy Research, 38(4), 357-387. Leach. D.J .& Siddall, S,W. (1990). Parental involvement in the ceachbng of reading; A comparison of hearing reading. paied reading. pause. pronmpt and praise, and direct instruction methods. British Journal of Educatie aI Psvchology, 60, 349-355. Li, D., & Nes, S. (2001). Using paired reading to help ESL students become fluent and accurate readers. Reading Improvement, 38(2), 50-61. Mathson, D. V., Allington, R. L., & Solic, K. L. (2006). Hijacking fluency and instructionally informativeassessments. In T. V. Rasinski, C. Blachowicz, & K. Lems (Eds. ), Fluency instruction: Research basedbest practices (pp. 106–119). New York: The Guilford Press. Miller, A., Robson, D., & Bushell, R. (1986). Parental participation in paired reading: A controlled study. Educational Psychology, 6, 277-284. Nes, S.L. (1997). Less-skilled readers: Studying the effects of paired reading on reading fluency, accuracy, comprehension, reader self-perception, and lived experience. Un- published doctoral dissertation, Texas Tech University, Texas. Palmer, M.L. (2010). The relationship between reading fluency, writing fluency, and read- ing comprehension in suburban third-grade students. Unpublished Doctoral Thesis, San Diego State University, San Diego. Pinnell, G. S., Pikulski, J. J., Wixson, K. K., Campbell, J. R., Gough, P. B., & Beatty, A. S. (1995). Listening to children read aloud: Data from NAEP’s Integrated Reading Performance Record (IRPR) at grade 4. The nation’s report card. Washington,DC: U.S. Department of Education, National Center for Educational Statistics. Rasinski. T. V., & Fredericks, A. D. (1991). The akron paired reading project. The Reading Teacher. 44. 514-515. Rasinski, T. V., Padak, N., Linek, W., & Sturtevant, E. (1994). Effects of fluency development on urban second-grade readers. The Journal of Educational Research, 87(3), 158-165. Rasinski, T, Blachowicz, C. & Lems, K. (2006. ), Fluency instruction: Research-based best practices. New York: Guilford. Rasinski, T. V. (2012). Why reading fluency should be hot . The Reading Teacher, 65(8), 516-522. Samuels, S. J. (2006). Reading fluency: Its past, present, and future. In T. Rasinski, C. Blachowicz, & K. Lems, (Eds. ), Fluency instruction: Research-based best practices (pp. 7-20). New York: Guilford. Schwanenflugel, P. J., & Ruston, H. P. (2007). The process of becoming a fluent reader: from theory to practice. In M. Kuhn & P. J. Schwanenflugel (Eds. ), Fluency in the classroom. NY: Guilford. Sidekli, S. & Yangm, S. (2005). Okuma güclügü olan öğrencilerin okuma becerilerinin gelisti- rilmesine yonelik bir uygulama. Kazun Karabekir Egitim Fakultesi Dergisi, 11, 393-413. Silverman, R. D., Speece, D. L., Harring, J. R., & Ritchey, K. D. (2013). Fluency has a role in the simple view of reading. Scientific Studies of Reading, 17(2), 108-133. Stahl, S. A., Heubach, K., & Crammond, B. (1997). Fluency-oriented reading instruction (Reading Research Report No. 79). Athens, GA: National Reading Research Center. Therrien, W. J., & Hughes, C. (2008). Comparison of repeated reading and question gene- ration on students’ reading fluency and comprehension. Learning disabilities: A con- temporary journal, 6(1), 1-16. Thornton, P.G. (2008).Effects of modified fluency-oriented reading instruction on Afrıcan Amerıcan boys’ oral reading fluency and attitudes toward reading. Unpublished Doctoral Thesis. Auburn University, Alabama. Walpole, S., & McKenna, M.C. (2004). The literacy coach’s handbook: A guide to research-based practice. New York: Guilford. Willis, J. (2008). Teaching the brain to read: Strategies for improving fluency, vocabulary, and comprehension. Alexandria, VA: Association for Supervision & Curriculum Development. Winn, B. D., Skinner, C. H., Oliver, R., Hale, A. D., & Ziegler, M. (2006). The effects of listening while reading and repeated reading on the reading fluency of adult learners. Journal of Adoles- cent & Adult Literacy, 50(3), 196-205. ISNAD YAMAÇ, Ahmet . "İLKOKUL DÖRDÜNCÜ SINIF DÜZEYİNDE BİR ÖĞRENCİNİN SESLİ OKUMA AKICILIĞINI ARTIRMAYA YÖNELİK BİR UYGULAMA". Kastamonu Eğitim Dergisi 23 / 2 (May 2015): 631-644.